…We may not hate even the prostitutes if they are devotees of the Lord. Even to date there are many prostitutes in great cities of India who are sincere devotees of the Lord. By tricks of chance one may be obliged to adopt a profession which is not very adorable in society, but that does not hamper one in executing devotional service to the Lord. Devotional service to the Lord is uncheckable in all circumstances. 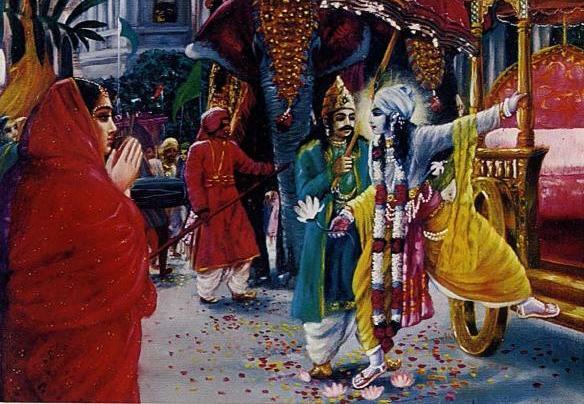 vāramukhyāḥ—well-known prostitutes; ca—and; śataśaḥ—hundreds of; yānaiḥ—by vehicles; tat-darśana—for meeting Him (Lord Śrī Kṛṣṇa); utsukāḥ—very much anxious; lasat—hanging; kuṇḍala—earrings; nirbhāta—dazzling; kapola—forehead; vadana—face; śriyaḥ—beauty. We may not hate even the prostitutes if they are devotees of the Lord. Even to date there are many prostitutes in great cities of India who are sincere devotees of the Lord. By tricks of chance one may be obliged to adopt a profession which is not very adorable in society, but that does not hamper one in executing devotional service to the Lord. Devotional service to the Lord is uncheckable in all circumstances. It is understood herewith that even in those days, about five thousand years ago, there were prostitutes in a city like Dvārakā, where Lord Kṛṣṇa resided. This means that prostitutes are necessary citizens for the proper upkeep of society. The government opens wine shops, but this does not mean that the government encourages the drinking of wine. The idea is that there is a class of men who will drink at any cost, and it has been experienced that prohibition in great cities encouraged illicit smuggling of wine. Similarly, men who are not satisfied at home require such concessions, and if there is no prostitute, then such low men will induce others into prostitution. It is better that prostitutes be available in the marketplace so that the sanctity of society can be maintained. It is better to maintain a class of prostitutes than to encourage prostitutes within society. The real reformation is to enlighten all people to become devotees of the Lord, and that will check all kinds of deteriorating factors of life. Śrī Bilvamaṅgala Ṭhākura, a great ācārya of the Viṣṇusvāmī Vaiṣṇava sect, in his householder life was overly attached to a prostitute who happened to be a devotee of the Lord. One night when the Ṭhākura came to Cintāmaṇi’s house in torrents of rain and thunder, Cintāmaṇi was astonished to see how the Ṭhākura could come on such a dreadful night after crossing a foaming river which was full of waves. She said to Ṭhākura Bilvamaṅgala that his attraction for the flesh and bone of an insignificant woman like her would be properly utilized if it could be diverted to the devotional service of the Lord to achieve attraction for the transcendental beauty of the Lord. It was a momentous hour for the Ṭhākura, and he took a turn towards spiritual realization by the words of a prostitute. Later on the Ṭhākura accepted the prostitute as his spiritual master, and in several places of his literary works he has glorified the name of Cintāmaṇi, who showed him the right path. mām-unto Me; hi-certainly; pārtha-O son of Pṛthā; vyapāśrītya-particularly taking shelter; ye-anyone; api-also; syuḥ-becomes; pāpa-yonayaḥ—born of a lower family; striyaḥ—women; vaiśyāḥ—mercantile people; tathā—also; śūdrāḥ—lower class men; te api—even they; yānti—go; parām—supreme; gatim—destination. O son of Pṛthā, those who take shelter in Me, though they be of lower birth-women, vaiśyas [merchants], as well as śūdras [workers]-can approach the supreme destination. Prabhupāda: Bilvamaṅgala Ṭhākura, in his previous life, he elevated himself to the loving stage of Kṛṣṇa. Not exactly, just previous, bhāva. It is called bhāva, ecstasy. But some way or other, he could not finish, so according to the instruction of Bhagavad-gītā, he was given birth to a nice brāhmaṇa family. (aside:) You can call that Bengali lady. She can hear. So very rich. Śucīnāṁ śrīmatāṁ gehe (BG 6.41), in that way. Rich family, at the same time, brāhmaṇa family. But richness, generally, sometimes glide down to wine, women, and intoxication. So by bad company he became woman-hunter, prostitute-hunter. So he was too much addicted to one woman, Cintāmaṇi. So his father died, and he was… He did not marry. In your country it is called girlfriend, and in our country it is called prostitute. So he was that about that prostitute, Cintāmaṇi. So he was performing the rituals, but he was thinking of his girlfriend, that Cintāmaṇi, “When I shall go there?” Bilvamaṅgala Ṭhākura? Yes. So he asked his servants, “Give me some food. 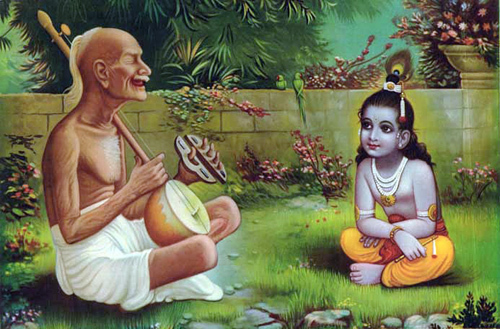 I shall go to Cintāmaṇi.” So anyway, he performed… Did not perform. His mind was there. He took some nice foodstuff, and when he went, there was a big river, and it was raining heavily, and the river was flooded. So he thought, “How shall I go the other side?” So one dead body was floating. So he thought, “It is a log,” and he took the help of the log and went the other side. And it was heavy raining. And then, when he reached that Cintāmaṇi’s home, he saw the door is locked already. Blocked. So he jumped over the wall, taking the tail of a serpent, and when he reached inside, he knocked the door, and Cintāmaṇi was astonished. “How did you come? So heavy rain. You had to cross the river.” He said everything, that “Oh, I cannot stay without you.” So she was much inquisitive: “How did you come? How did you jump over this wall?” And so he showed everything, that there was a big snake, and so he thought it as rope and jumped it. And then, when he went to the riverside, he saw that was a dead body. So at that time Cintāmaṇi thought, “Oh, this man is so much addicted to me.” So she told, “Oh, this much attraction if you would have with Kṛṣṇa, oh, how nice your life would have been.” So immediately he came to his senses because he was lifted to that position in his previous life. So immediately he left and was going alone to Vṛndāvana. And on the way he saw another beautiful woman. So his business was to be attracted by woman. So he again became attracted. So he was following. So this woman, after entering, she told her husband, “Just see, this man is following from a distant place.” So he asked him, “Oh, come on.” He saw he is nice gentleman. He was a rich man, brāhmaṇa. “What is this?” He said plainly, “Oh, I have been attracted by your wife, by the beauty of your wife.” “All right, come on. What is that?” You enjoy my wife. 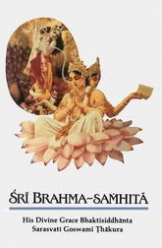 You are brāhmaṇa. You are…” So he was received well. And at night, when he was given place, then he asked that woman, “Mother, will you give me your hair pin?” He took the hair pin and pushed in the eyes: “Oh, these eyes are my enemy.” Since then he became blind. And in that blindness he was worshiping Kṛṣṇa, and Kṛṣṇa was coming to him. And he would not touch. He’ll sing, dance, and He’ll supply milk and go away. So this Bilvamaṅgala Ṭhākura wrote one book, Kṛṣṇa-karṇāmṛta. It is very valuable book. That is very highly estimated, Lord Caitanya.